For basil, this one smells really nice and strong. It is a woody herbs, with stem hairy. Leaves are elliptic, pointed to tapering, base flat or blunt, nearly entire, sparsely hairy or hairless; leaf-stalk up to 2 cm long. Flowers are borne in racemes 13 cm long, densely velvet-hairy. Flowers are 5-7 in each whorl; calyx 3 x 5 mm, upper lip 3 x 3 mm, round, densely hairy. Flower are white, 5 mm long, hairless; filaments hairless. Nutlets are 1.5 mm long, sub-trigonous, minutely pitted, dark brown. Young leaves are consumed raw or cooked. They are steamed and eaten as a side dish with rice. The leaves can also be used as a flavouring in salads, sauces, soups etc. 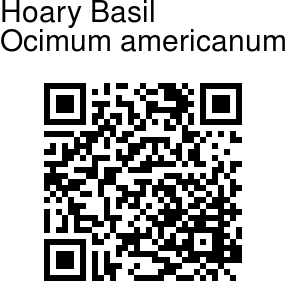 Hoary Basil is found in the Himalayas from Kumaon to NE India, till altitudes of 1000 m. It is also found in Western Ghats and parts of Africa and SE Asia. 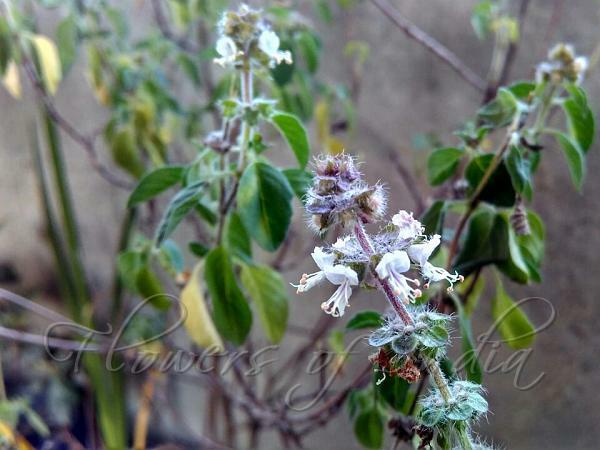 Medicinal uses: The leaves are made into a paste that is used in the treatment of skin diseases. The paste is also applied to wounds and burns that do not heal well.